Can you solve the Riddle of the Sphinx ? This summer sees one of the mysteries of Egypt come alive at the Museum, as hidden golden sphinxes emerge for our special summer trail. Put your code-breaking skills to the test and take on the ‘Sphinx Trail’, beginning on Saturday 14th July and running until 9th September. Hieroglyphic symbols are hidden throughout the galleries and you have to crack the code to reveal a very special hidden word. All the efforts will be worthwhile however, as there’s a prize for everyone that takes part. Of course the museum’s links with Egypt are well known. In 1801 the 28th (North Gloucestershire) Regiment of Foot was awarded the Back Badge following the Battle of Alexandria. Visit our timeline to find more information about this historic battle. 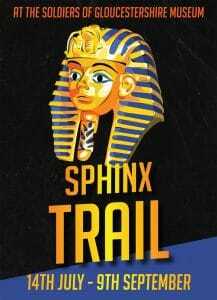 Pick up a Sphinx Trail sheet from the Museum reception desk when you visit.